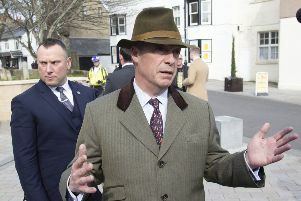 The national leader of UKIP Nigel Farage this week made a passionate defence of a free press when he visited West Sussex as part of his Common Sense tour of Britain. The three main parties in Westminster - the Conservatives, Lib Dems, and Labour - are set on a course of imposing draconian controls on newspapers through a Royal Charter, claiming that this was the wish of Lord Leveson following his inquiry into press standards. But Leveson made clear in his report that local and regional newspapers were not guilty of any of the offences and should not be penalised by any subsequent regulation. However, newspapers such as this one will be bound by the same costly and bureaucratic regulation as national titles and are campaigning vigorously against the imposition of such a colossal burden on free speech. Before Mr Farage addressed a packed meeting at Coldwaltham on Monday night, he responded to concerns raised by the editor of this newspaper. “Freedom of speech, democracy, the rule of law – these are the absolute fundamentals of free western society, and indeed one could go further and say we fought two world wars to defend these very things,” Mr Farage said. and what we know with all forms of state regulation is that it becomes costly bureaucratic and effectively puts out of the game many of the smaller and medium sized players. “I am very worried about it, and I don’t like it one bit. He said he was particularly concerned at the impact on local newspapers, which are seen as some of the most trusted and responsible sections of the printed media industry. “The position of the local press is really very similar to that which I have seen through business industry and commerce where Government sets up structure that actually allows the big boys in many ways to prosper, because it puts out of business medium sized competition. “So I completely buy your point that it will fall disproportionately heavily on the small newspapers. He said vexatious complainants could tie local newspapers up in knots. “I don’t want an irresponsible press, you know I want us to have a proper free press that behaves responsibly and within the law. This newspaper also asked Mr Farage about his views on greenfield development and the pressure for more housebuilding given the title’s Save Our Countryside and It’s Just Plan Crazy campaigns. He responded: “Well of course there is because we are still pursuing open door immigration. The population of this country is rising and nearly 50 per cent of the houses we are building are directly as a result of a rising population through this open door policy. “And it is something that I think is wrong, is irresponsible, and in many many ways the Bulgarian and Romanian debate actually comes back to all of these issues. “We are on the verge I think of the second great migratory wave from Eastern Europe coming into Britain and I think that is a mistake for a whole host or reasons. “You’ve got the problems here (West Sussex) with housing and I was in Boston last week, where ambulance waiting times at A+E are now nine hours on average because the population has outgrown the infrastructure that exists. “So I do accept that we need to build some new houses and we must build them responsibly but 50 per cent of it is completely irresponsible. “And I would also add one last thing if I can with reference to West Sussex, for this Government and the next Government to meet the CO2 targets we have agreed to in Brussels we are going to have to build 20,000 more wind turbines between now and 2020. They are ugly useless and expensive. “They tax the poor, they give money to the rich, they don’t reduce CO2 emissions. James Landale, the BBC’s deputy political editor, covered UKIP leader Nigel Farage’s speech at Coldwaltham on Monday. Read his account of the evening on the BBC site.